Michael Traister is a Partner at Murray Plumb & Murray, Chair of the Construction Group, and Co-Chair of the Litigation & Trial and Construction Practice Group. He also focuses on Business Reorganization & Insolvency and Land Use & Environmental Law. My uncle is a prominent attorney in Boston. I looked up to him and interacting with him over the years sparked the initial interest. As time went on, I became interested in the subject matter and the possibility of doing some good in the world. Part of the attraction was the intellectual challenge of it. It’s a job where you’re constantly learning something new. How do you recommend people find the right attorney to suit their needs? You can find a lot of information online these days, there are websites that have all kinds of background, ratings and reviews. I think the best way to choose someone specific is to have conversations with people who have been clients of a particular attorney. If you’re able to, talk to more than one lawyer before you hire someone. Get a feel for the market. Everyone is different, so be sure to find someone you can establish rapport with and have confidence in. Unfortunately, it’s not always the happiest situations that bring you to a lawyer, so it’s important to find someone you’re comfortable with to help you through a challenging time. Is there any one case that’s made a lasting impression on you or that you’ve learned the most from? There was a case probably ten years ago in which I represented a group of relatives in a situation where an elderly couple had passed away. They had no children of their own, and it was clear that they wished to have their assets evenly dispersed among all nieces and nephews on both sides. One niece had come forward and essentially stolen the estate and assets for herself. It was gratifying because the court system worked to right a very clear wrong. It went all the way through a jury trial, we prevailed, and even got punitive damages awarded. You actually have an opportunity to help people solve problems and work through hard times. Peter Plumb once described the work we do as lawyers as similar to the work of a plumber. You get involved it situations where there are disputes, the works get “mucked up,” and you help people “unmuck” the works so to speak, to get things back in working order. What is the best advice you’ve received about practicing law? Steve Murray was still alive and practicing when I started working with Murray Plumb & Murray years ago, and he had several quips that resonated with me. “Forget everything else, it’s all about equity,” was one. At the end of the day our jobs are about equity, justice, and fairness. It’s important to keep your eye on the big picture. Also from him – “Don’t think you’re special.” There are a lot of really smart lawyers, people who went to good schools, who can all do the job you’re doing. Focus on putting your clients first. At the end of the day, it doesn’t matter how great of a technical lawyer you are, but satisfying your clients will keep you in business. Who has been the biggest influence on your legal career? My uncle was an original influence, and then later on Peter Plumb. I’ve learned a lot from him about client service: respecting the client, respecting opposing counsel, not making things personal, always being professional and collegial. And of course, always making sure you do the highest quality work. What causes are you passionate about in your personal life? I do some civic volunteer work within my community. I volunteer as Moderator of the Town of North Yarmouth’s Annual Town Meeting each year, as well as moderating any special and other town meetings. I also chair the Zoning Board of Appeals for the town. Does your role as an attorney help you in that work? I do property and land use work in my own practice, so that does help in some ways. It’s helpful in generally understanding the concepts that come up, but also applicable when I run zoning board meetings and know the legal standards that apply. How did you choose your practice area? Before law school and after college, I was very much in the corporate world, so early on I thought I’d end up more in the corporate realm. When I was starting out, new lawyers typically had a general focus. Young lawyers would help whoever needed assistance, which was a good way to hone your skills and develop your area of interest. 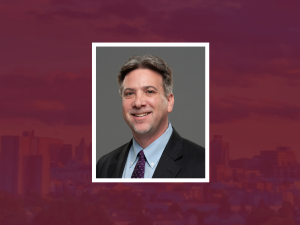 When I joined Murray Plumb & Murray I got involved in real estate and lending work with Drew Anderson and eventually got into litigation matters with Peter Plumb, and my own practice grew from there. Three favorite activities outside of work? In hindsight, it would have been helpful to take a bankruptcy course or something on the basics of probate.